Sure, we all know math is hard. But c'mon, advertising the price of something isn't exactly advanced trigonometry. Let's get it together people! 1. Why pay less when you could pay more? 2. Count 'em: 1,2,3,4,5,6,7,8,9... 20 calories! 3. Yeah... that's not the quadratic formula. 4. No wonder we never feel full after a 10-piece! 5. Alternative kicker: "So we increased it by less than that." 6. Hey, doubling your swagger costs money. 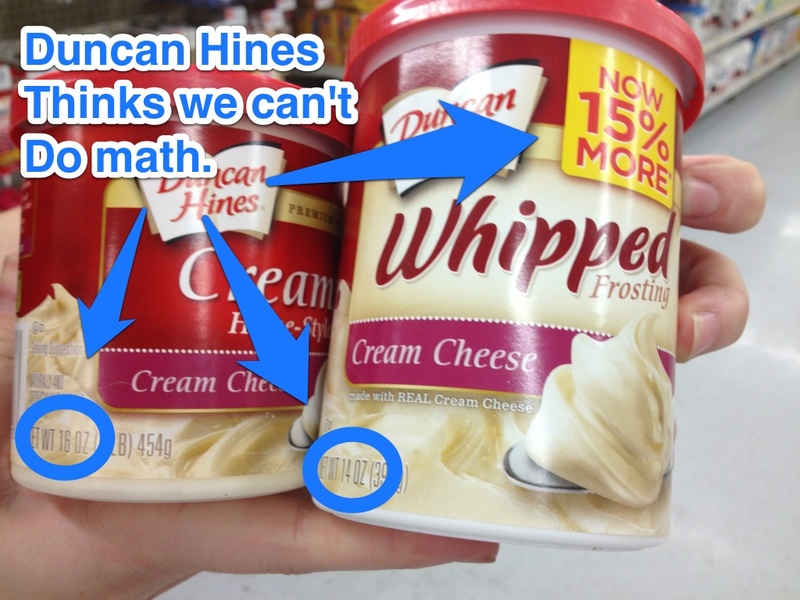 CORRECTION: A previous version of this post compared the size and weight of Duncan Hines Creamy Frosting and Duncan Hines Whipped Frosting, the latter of which is larger because, well, it's whipped. As such, it was our comparison that was wrong, not the company's math. We regret this error.